Tyendinaga Mohawks block Via railway with bus, 2007. OTTAWA — Intelligence officials are concerned that extremists might infiltrate peaceful anti-petroleum protests to “incite violence,” a newly disclosed assessment indicates. The federal analysis of threats to the passenger rail system introduces a new twist to the often tense debate over state scrutiny of environmental demonstrators that otherwise harmless activists might unwittingly harbour dangerous terrorists. 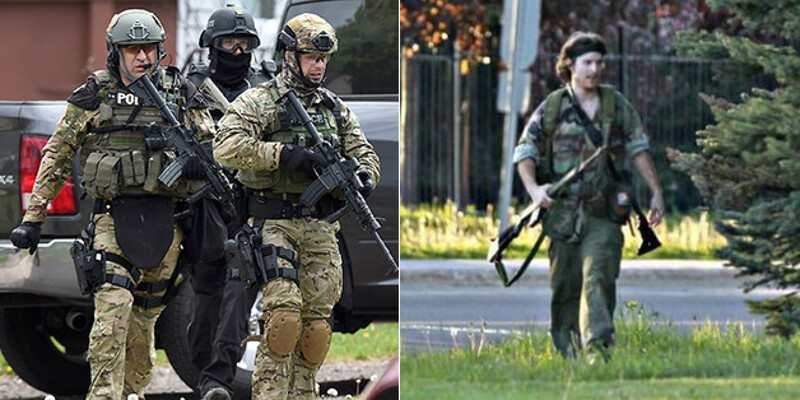 Members of RCMP ERT (left) and Jason Bourque, alleged to have shot and killed 3 RCMP officers in Moncton, New Brunswick. The 30-hour search for Justin Bourque came to a sudden end Thursday night soon after the arrival of an aircraft rigged with sophisticated surveillance equipment normally deployed to patrol the Canadian coast. As police on the ground struggled to track the man alleged to have gunned down three Mounties, behind the scenes officials at Transport Canada told the RCMP they had a powerful asset in reserve. It turned out to be key to capturing the accused killer.